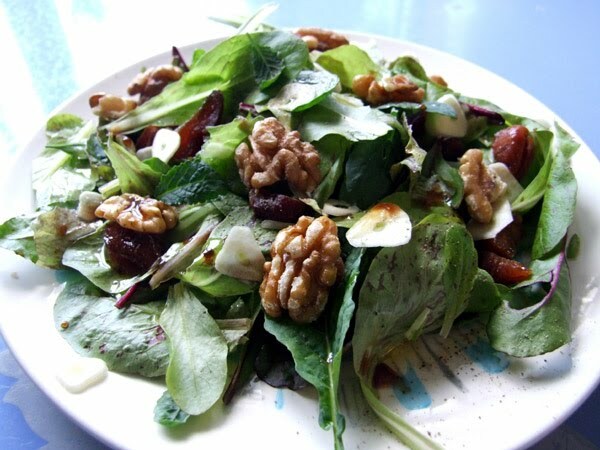 Forellenschluss lettuce, baby beet greens, baby kale, baby chard, and the last of the spinach, with dried apricots, raw walnuts, raw garlic sliced paper thin, extra virgin olive oil, balsamic vinegar, salt and pepper. If I had some good crumbly cheese on hand, I would have tossed that it, too. I've never grown my own greens before this year, so it is a revelation what a difference there is between store-bought greens and garden-fresh greens. Which makes sense, of course: on cut flowers, the first thing to wilt are the leaves. Last year I learned how much more sweet and tender farmer's market cabbage is compared to to co-op cabbage, but I was not similarly impressed with the more delicate greens like lettuce--because even at the market, it's been plucked for several hours, and then spent several more hours in my fridge at home. But when the first spinach was ready in the garden, I was astounded by how delicious it was, and now I wish I'd planted more; it's too hot to start a second planting, and now I'll have to wait for fall. I grew up on iceberg lettuce salads with thick, sugary dressing, and even though I've expanded my culinary horizons since then, I was not expecting garden-fresh greens to be so much more flavorful than store-bought greens. I can't imagine dressing this salad with anything more than oil and vinegar, and even that seems a bit extravagant. I was reading a garden book last winter that recommended planting at least six different kinds of lettuce and I thought, "Six kinds? Of lettuce?" but, oh, I am converted now. I was planning to expand my garden anyway, and next year I will plant more spinach, more lettuce, more everything.